The Campbell Cup is back at Cooper! Sunday, September 14, 2014, in the annual Campbell Cup match, The Cooper Union Soccer Team secured a 2-0 victory over the Culinary Institute of America (CIA). Named after John Campbell, former athletic director at CIA and formative figure in the longstanding relationship between Cooper Union and the Culinary Institute, the cup was established many years ago as a contest between two institutions who are leaders in their respective fields, and who share a passion for pure amateur athleticism and good sportsmanship. The match began with both sides exchanging goal-scoring opportunities, but neither team able to find the back of the net. Cooper Union finally broke the deadlock in the 30th minute when Campbell Taylor, 2nd-Year Architecture scholar athlete, picked up the ball in Cooper’s half, evaded a two-footed challenge from a CIA player, and skipped around three other CIA opponents to get to CIA’s end line before driving a low cross on the ground to the middle of the opposition 18-yard box. Campbell’s cross was met by Mateen Nemati, freshmen Electrical Engineer, who - while falling backwards from a push behind- deftly directed the ball into the top left corner of the goal with his weaker foot. The entire team exploded in celebration as Cooper Union recorded its first goal of the Fall 2014 season! But not long after, in the 32nd minute, the resolve of the team was put to the test. Campbell Taylor was at the center of the action again, this time conceding a penalty against CIA. With a precious lead on the line, the penalty kick could decide how the remainder of the game would play out, but goalkeeper Eugene Sokolov, junior Electrical Engineer, saved the CIA penalty kick and kept Cooper Union in the game. Once more Cooper erupted in joy, and this time also relief, at the shot-stopper’s heroics! The goal in the first half and the penalty kick gave the team the confidence to push on for a more secure margin in the second period, and another goal for Cooper came in a dead ball situation in the 61st minute. CIA conceded a foul on Charles Dorrance-King, 5th-Year Architecture scholar athlete, just inside the center circle. Andrew Pena, freshmen Civil Engineer, stepped up to take the free kick, and lobbed a beautiful pass to Stephen Leone on the left side of CIA’s 18-yd box for the junior Electrical Engineer to prod home. 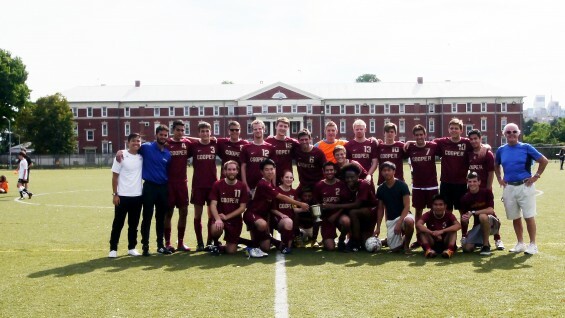 Cooper Union held on to the 2-goal lead until the final whistle to lift the Campbell Cup trophy. The Cup win is a momentous victory for Cooper, who bring the trophy back after four consecutive seasons in the hands of CIA. Campbell Taylor was awarded Defensive Player of the Match for his all-around consistent game and the fine build up and assist for the first goal, while Mateen Nemati was presented with the Offensive Player of the Match for his excellent hold-up play and penetrative runs. While Campbell and Mateen earned the individual accolades, the entire Cooper Union Soccer Team deserves praise for its fully-committed and fully-focused effort throughout the match. Dean Baker, VP of Student Affairs Community Relations and Dean of Athletics, was there to celebrate with the team, as were Coaches Henry Fok (AR’11) and Fabio Alvino-Roca (AR’11) who are proud of the progress the team made after a 0-2 defeat by the same opponent just a week earlier. Coach Henry and Coach Fabio are assured the win will give the Cooper Union scholar athletes the confidence to continue training hard and to continue challenging tough opponents during a busy athletic and academic schedule in the weeks ahead. Congratulations to the Cooper Union Soccer Team!